R&M offers the modular Mercury splice distributor in particular for the setup of data center networks, data center interconnect cabling and campus backbones. Mercury can take care of several tasks simultaneously which means users can save a lot of time. 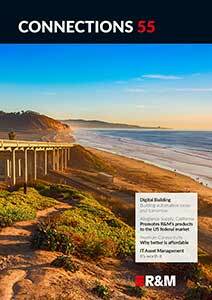 The time spent on installation, test and commissioning can be halved in comparison to conventional solutions. High packing density and convenient handling mean Mercury is setting new standards in fiber optic connectivity. After the market launch in 2018 it became clear that customers particularly appreciate the clear and structured setup. The chassis occupies two height units (U) in a 19” rack. 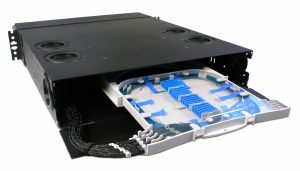 The housings feature a modular patch panel on the front which can accommodate up to 288 LC connections per section. The connections are in two blocks each with six trays. 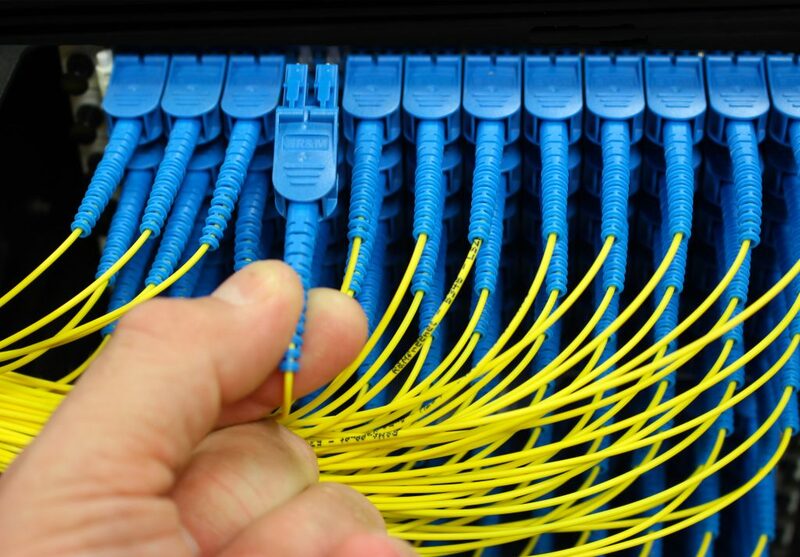 Like the patch panels the SD-08 splice trays are designed for 288 fibers. The 1:1 ratio simplifies planning. A typical configuration occupies 6U and terminates 864 fibers. With 48U, the Mercury boxes connect up to 6,912 fibers in a rack. The cabling is based on ribbon fiber cables which are widely used in the US. These cables make it possible to splice several fibers at the same time. And that speeds up work. R&M offers versions with 200 μm and 250 μm fibers. The slimmer variant requires 30% less space in cable runs. The patch panel modules are optionally available with factory-pre-terminated ribbon fiber trunks. The effort involved in installation and verification is minimized as the connections and trunks are factory-measured. In such a densely packed distributor, it is impossible to plug conventional patch cords in and unplug them at the slip-in window at the front without using tools. R&M recommends patch cords with the LC QuickRelease Uniboot connector (LC-QR). A push-pull mechanism enables the locking and unlocking of these connectors via the boot.